After giving you his heart in has last album, Meimke D’Lipa, Lipa takes a Leap of Faith with his upcoming album as he continues with his high energy, excitement and pure joy. Lipa has once again teamed up with an up and coming star on the Jewish Music scene, Naftali Schnitzler to produce one great album! They each bring their own, unique talents to the table and Lipa says when they work together “it’s electrifying”. Being a Yiddish speaker, most of Lipa’s work was done in Yiddish. However, this album will feature several English and Hebrew songs. While it will have less Yiddish, it will still have the classic Lipa feeling. The album will consist of 12 new tracks with compositions by Yossi Green (who has composed in the past some of Lipa’s biggest hits including Gelt, Wake Up and Diet), Pinky Weber, Moishy Lax, Yishai Lapidot, some newcomers on the scene, and Lipa himself. Arrangements on the album were done by Mona Rosenblum, Ruvi Banet, Moshe Laufer and Naftali Schnitzler. The superb choir will feature some of today’s biggest Chasidish vocalists including Shloime Daskal, Shragee Gestetner, Pinky Weber, Yoeli Greenfeld, Sruly Green and Tzali Gold. As told to us by Lipa himself, this choir will be something to behold. Lipa confided that throughout his life, when times got rough, his faith kept him going. Today with everything going on in the world, the Jewish people need to hold on to their faith, thus the name of his new album! The album is hitting stores today and will is available online for digital download on MostlyMusic.com. 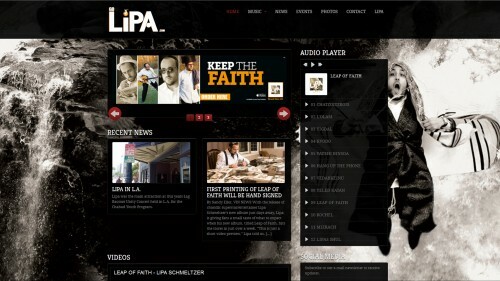 In honor of the new release Lipa is launching a NEW WEBSITE. The new site GoLipa.com will be THE destination for ANYTHING and EVERYTHING Lipa. Also a groundbreaking music video is in the works as well, and it will be something never seen before! The video will be released about a week or two after yom tov so stay tuned. Meanwhile enjoy the album sampler below.